Press "X" to hide in a mass grave with friends. 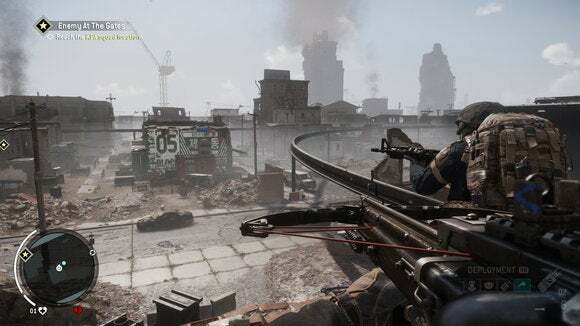 Suffice it to say, I was pretty surprised when Deep Silver reached out to show me more of this new Homefront last week and I was told we’d be seeing multiplayer. Four-person cooperative multiplayer, to be exact. Deep Silver’s built out a hell of a lot of customization options, so you can choose your personal favorite flavor of guerrilla fighter—that gun totally goes with that jacket, way to accessorize—and then you buddy up. This isn’t campaign co-op, though. 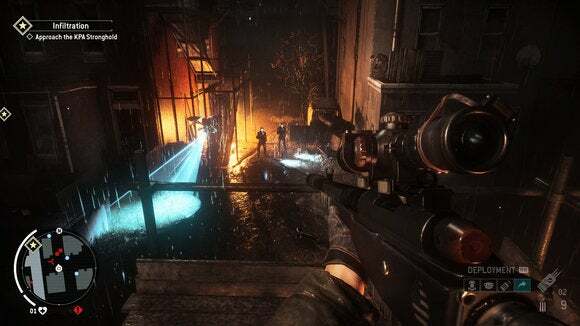 It’s more akin to Halo 4’s Spartan Ops or maybe Destiny—bespoke four-person scenarios, which play out almost like campaign missions but contained in their own separate mode. Deep Silver says there will be a dozen scenarios at launch, at around twenty minutes per. Then they’re putting out twelve months worth of free DLC, bringing the total to thirty-two scenarios by next year. It’s an impressive amount of post-launch content, and between this and Hitman I’m wondering if we’re seeing a shift away from paid DLC. One can hope. We played two of these scenarios during our demo: One which tasked us with hacking into some radio dishes, and one night exfiltration mission where we stole a convoy and had to guide it out of a hostile zone. The good news: Deep Silver’s tightened up the shooting since last time I played. 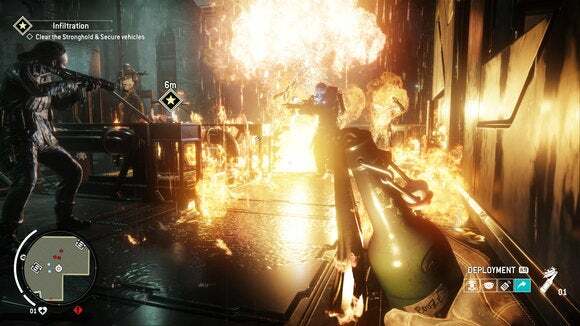 When I got hands-on time with Homefront at PAX last year the guns felt weak and wobbly. This time around, everything felt about as solid as you’d expect from a big-budget shooter. And the scenarios were a decent showcase for Homefront’s moment-to-moment action. The night operation was particularly engaging, as first we crept up on an enemy outpost, took out the guards outside, battled our way in, led a convoy out into the night, and then encountered multiple ambushes. The pacing is excellent, moments of tension alternating with moments of panic. The other mission, not so much. Hacking into radio towers, that push-pull of tension/panic was entirely absent. It’s your standard “Go to this place, shoot a bunch of guys, capture the objective” mission. Not quite on the same level. But regardless of the quality of the missions, we’re left with two main questions. First is, I think, the obvious “Will anyone play this?” The original Homefront had multiplayer too, and uh...well, it existed. That’s about all I can say. As with many shooters, I can’t help feeling money and time put towards these modes might be better spent on the singleplayer. Admittedly, I like the “four-person guerrilla team” conceit. At least it makes some semblance of sense, thematically. And with more scenarios on par with the convoy exfiltration, I’d be tempted to dip a toe or two in Homefront’s multiplayer waters. The bigger question is carried over from PAX, though: What kind of game is Homefront? I still don’t know. I don’t think I’m wrong in assuming that singleplayer is the main draw of this game, and so while I enjoyed my (admittedly brief) time with the multiplayer it’s...sort of inconsequential to me. My worries about the campaign—that it’s too action-oriented, that it’s more concerned with video game heroics than grittiness—weren’t really swayed by the multiplayer. And why should they be? These are twenty minute scenarios, designed around tightly-focused action. But admittedly, a loading-screen tip that said “Upgrade weapons to increase badassery,” doesn’t really give me great feelings about the tone Deep Silver is aiming for with Homefront: The Revolution. I don’t know. The game is (finally) mere months away from release, and perhaps all this skepticism will be for naught. I’ve never been less sure about what I was seeing pre-release than I am here. The multiplayer is decent, but without a solid singleplayer base to build on I’m not sure it has legs on its own. Maybe Deep Silver will do one more press run before launch to show off some quieter singleplayer moments. If they do, I’ll keep you updated. 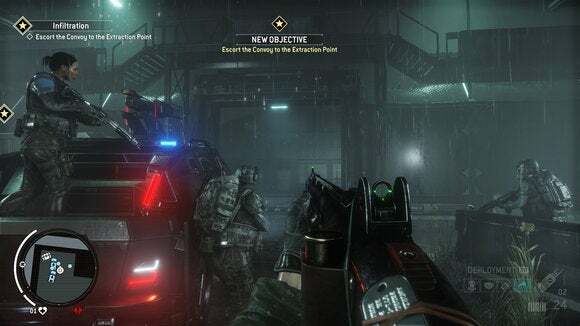 Otherwise, meet me back here for a review sometime later this year—Homefront: The Revolution is slated to launch on May 17.